After meeting Benja, my Chilean connection, and eating a whole guanaco leg (think beige llama but bigger) the night prior, I bussed to the Porvenir ferry terminal to meet him and the truck that would take us to the farm. I arrived with a backpack full of gluten free food (#ActualAllergy #NotHipster), a sunburnt nose and an inability to stay warm in the fierce winds. Benja was unperturbed by the weather and even managed a half hour nap lying outside on the concrete. 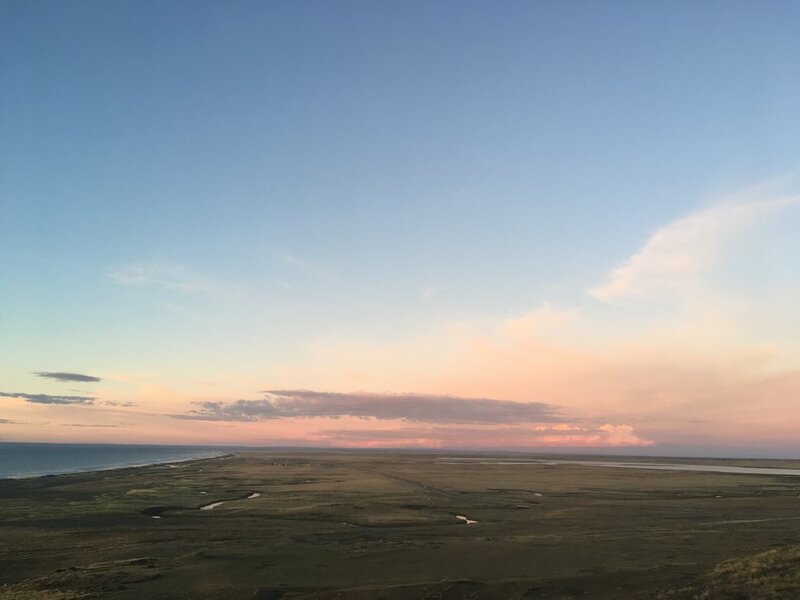 The view across Magellan Strait from Punta Arenas. The ferry to Porvenir, note an absence of traditional docks. Boxes of corn, boxes of lentil stew and some very bad chocolate were life savers. Soak them for 24hrs and enjoy. Available in all supermarkets. The northern end of Tierra del Fuego is the remnants of ancient glacial moraines. The landscape flattened and smoothed nearing Useless Bay. A new modern and very suave cabin for tourism sits overlooking the bay. Wild horses, flamingos, condors and king penguins below. The ferry was a double ender with long ramps that lowered onto the beach. There are no docks. We spent the two hour ferry ride watching Sei whales, gliding albatross’ and black and white counter shaded Commerson’s dolphins perform acrobatics. Onboard we met two of the ovejeros, or sheep shepherds, and a barrel shaped dog who had no sheep herding skills, but was apparently a legend at chasing the introduced Canadian beavers. We stopped in Porvenir and loaded up with chocolate bars and supplies then lost ourselves to daydreams and the dull roar of studded tires rolling on gravel roads. It was a two hour drive to Tres Hermanos farm, at the head of Useless Bay. The farm has young, awesome owners, and like most small farms in the world these days struggles to maintain a constant supply of labourers. So, upon arrival we met more than just ovejeros. Help for La Marca (‘the marking of the sheep‘) consisted of a group of university friends who were more than happy to see each other again. The day started with the screams of a wild animal as a long haired whippet killed a wild cat outside the window. We passed time throughout the day cutting firewood and attempting to photograph flamingos (yes, at 53 degrees south, there are flamingos). After which we napped for three hours, which is a cultural thing that busy North American, 8-hour sleep, type people aren’t very good at. I at least didn’t understand the need for it, but I didn’t fully appreciate what was coming. Driving past one of the erratics. Great bouldering projects. Setting up the portable netting for the funnel that would travel from us from field to field. Lying in wait. If the sheep saw movement there was a chance they’d startle and undo all the hard work of those on horseback. Getting raked by cold winds, stillness was required until the entire flock had made it into the funnel. After all the run aways were caught, gates were closed. We left the sheep for the night, ready to go for the mornings sorting. Sun sets over Useless Bay. At 3pm we drove deep into the farm. It was described in size as, “walk to the horizon, then do it twice more to see where it ends.” The geography is a mix of hills, interconnected flat fields and tough knee high scrub. Tossed like ancient marbles across the landscape, giant granite erratics (boulders the size of houses) poke out at funny angles and add a piece of curiosity to each vista. Several people were on horseback, while two diesel trucks carried the rest of us. Those on horseback disappeared from sight as they searched for the flock of sheep. In the meantime, the rest of us set up a large funnel shaped fence to corral the flock into a smaller field. Unfortunately, two on horseback were tossed —one into a river and the other into the mud. One spent three hours digging his horse out. We lay in the wind, unaware, for five hours waiting in stillness so as not to scare the sheep. Shelter was scrub, so lying in the grass with hands pulled into sleeves, collars up and arms crossed was the best way to stay warm. I regretted my lack of warm hat and choice to wear only a t-shirt and sweater. Eventually, the flock was seen and driven into funnel. We popped up from hiding and did the work to run a net across the back of the funnel and drive the sheep into the smaller pen. We finished at 9:30pm and drove back down to the farm. Night cap was a glorious warm mutton soup and cutting the next days lamb up with a hack saw. The next day started the day at 4am after three hours of sleep. I ate some canned corn and peanuts for breakfast and we drove out to the field. Those on horseback took an hour to round up the escapees. Then we worked to herd the sheep into consecutively smaller pens —separating the lambs from the adults. The idea is to understand overall flock numbers after the spring lambing season. Then ‘mark’ them for wool quality for the Patagonian merino breeds, or by size for the meat lambs. Marking means lifting the lamb up, resting it on a wood railing and having four people rotate through to inspect it; clipping both ears with the farms pattern, castrating the non-breeding males, cutting of tails, and painting the male and females a different colour. While yelling “Macho!” or “Hembra!” to speed it up for the painter and the tail cutter who tosses tail into a male or female pile to be counted later. Closing the fence after catching the last of the escapees. Looking down at the mornings group of sheep to be sorted. Antonio keeping the troops happy. The trusted 4 cylinder diesel Nissan’s. The last few lambs are sorted. Pick what you want out with your hands. Counting the males, females, and males that weren’t castrated tails. A new definition of fresh. Most farms in Canada dock tails with elastics. The argument here was that cutting them was faster and more humane compared to leaving tails to rot off. A dead albatross amongst the debris washed up. It was messy work. Sheep faeces and urine, disgruntled 30-100lbs bawling lambs, and warm splattering blood coupled with sun and wind burn. The morning session saw 693 lambs counted and marked, a good return over the prior years. Lunch was fried lamb and onion in a large cast iron pan held up over a wood fire with welded rebar legs and tucked out of the wind behind a large boulder and an old wood fence. Meat was served with white bread and an incredible chili sauce. Being allergic to gluten and vegetarian was something I shared for a laugh later, but for the time being, lamb was lunch and dinner. After lunch the process was repeated, getting everything ready for the next day. An eye opening moment was an ovejero showing us a traditional method of castrating a lamb; instead of elastics, he used a knife to make a small slit in the scrotum and used his teeth to pull the balls out. Sheep rounded up with funnel netting visible. Antonio minds the cooking fire and takes shelter for the day. Another 4am start. We finished a flock in the same field and then moved deeper into the farm. Memories from this day are: large granite erratics, old wooden bridges, pummelling rain, and chasing escapee lambs at full sprint through thick scrub bush with the help of all the dogs. The weirdest part was having the rain clear off and getting a sunburn an hour later. Surprise mother f&%ker, it’s rain time. Antonio kept the fire going somehow. One of the many micro windbreaks for a fire scattered around the farm. I fell asleep on the couch at 6pm, then transitioned to a sleeping bag four hours later. We slept in and started at 6am. The whole crew mobilized and drove an hour down the highway to another section of the farm. There was another set of horses and dogs, and a caretaker in a cabin —all infrastructure that was put to use for the next two days. The scrub brush was replaced by grass. Commuting an hour down the highway to another section of farm. Taking in the mornings job. Admiring the daybreak amidst a new landscape. A whole new set of infrastructure. A dense flock of sheep waits for our next move. Sleeping when you can, where you can. Asleep in the wind waiting for sheep. Firewood can be surprisingly comfortable. Each flock contained somewhere between 4-700 lambs. A moment without wind, enjoying the little things from the look out. After the days work we drove back to Tres Hermanos. The wind had abated and we took in the sunset from a grass topped sand bluff overlooking Useless Bay —keeping a ready eye out for the Sei whales Benja was monitoring. Sea urchins were collected for dinner and we watched several tiny black and white dolphins play in the waves 2-3 meters off the beach. In Chilean style, we started cooking dinner at 11pm. We started late and commuted back to the same field. It was quickly finished and we took a much appreciated afternoon off. Plans, like always, changed several times over the course of the meal. Eventually, a last minute decision was made to try and leave that night. We drove across the island, music blasting. A bus delivered us across the Strait of Magellan and back to Punta Arenas later that night. Saying goodbye to the overalls. The ferry back across the Strait of Magellan. The experience at Tres Hermanos was over. Thousands of sheep had been sorted and there was still two weeks until the work contract in Antarctica started. Legs itched and Patagonia called. I packed my tent and caught a bus north into the mountains.